Sadhguru urged students in JNU to stay away from taking sides because by doing so, they are destroying democracy and creating a feudalistic society. Spiritual leader Sadhguru delivered the Nehru Memorial Lecture at Jawaharlal Nehru University. 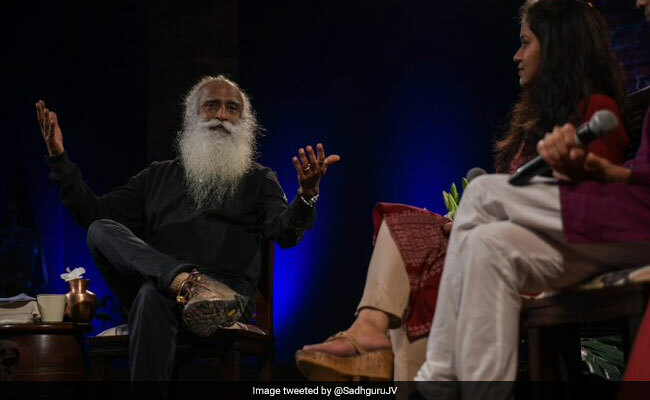 Students should debate on issues but not take sides, said spiritual leader Jaggi Vasudev, better known as Sadhguru, at Jawaharlal Nehru University (JNU) in Delhi, while noting that the country has become "ideologically divided" like the US in the past 10 years or so. He also expressed concern over the cases of suicides among teenagers due to education-related issues and stressed there is a need to revisit the education system. The spiritual leader delivered the Nehru Memorial Lecture at the varsity and spoke about a variety of issues ranging from education, democracy, monogamy and artificial intelligence. He also paid homage at the Wall Of Heroes at the varsity when he had come, JNU vice-chancellor M Jagadesh Kumar said on Twitter. In response to a query by a student on how one can remain neutral in JNU, which is a politically vibrant campus, he said, "This has become a phenomenon across the county. If you open your mouth to say something about the nation, they will try to fix you something to some ideology. Inevitably someone is trying to pin you on some board. Unfortunately, this is how you are destroying a democracy." "What is the point of secret ballot? What is the point of offering a citizen the choice of choosing?" Citing the example of the US, he said citizens there are either Republicans or Democrats. "We are becoming like that. US was unfortunately divided like that for decades but that was not there in India. But in the past 10 years or so, everyone belongs to some party. This is destruction of democracy. Three months before elections, one should start evaluating whether they have done something. You must evaluate according to your intelligence. There is enough information available to help you do that," he told students. He said that a country's citizens, especially students, should not be politically inclined. "If you want a lively democracy, except for a few committed party workers, the rest of the country should not be committed to any political ideology. But unfortunately, it has become a worldwide phenomenon. I was proudly speaking in the US about Indians living democracy till sometime back. I have just kept quiet about Indians living democracy in the past five years. We have become the same thing," he said. He urged the students to stay away from taking sides because by doing so, they are destroying democracy and creating a feudalistic society. "You must debate on issues but do not take sides at this stage. You are just destroying democracy. It becomes a feudalistic society then. Otherwise we can function like China. But we have chosen a democratic process," he stressed. The lecture was an interactive session where one of the students asked him about his view on the education system. "Seven-thousand children below 15 years of age are committing suicide. If 12 or 13-year olds start killing themselves, are we not doing something fundamentally wrong in our society. Children aged 12 or 13, who must be exuberant about life, are taking their lives. Unfortunately 90 per cent of suicides are education-related. Definitely we need to revisit education. We are trying to put everybody through the same process and nobody is equipped to go through the same process. It's the most cruel way of handling a child," he opined. hold of possibilities and can accomplish the task of moving five hundred million people from abject poverty to reasonable level of well-being. "The only country which has done that is China but through the use of bullets. But they have done a great job. Keeping people in poverty through generations is worse than killing them. You can condemn them or admire them. It's a set of painful wisdom for me," he said.